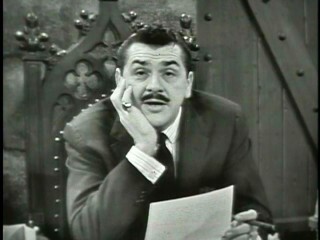 Ernie Kovacs was born on January 23, 1919. As we approach the 100th anniversary of his birth, we must not merely remember his role as a pioneer in the early years of television, but rejoice in how Kovacs pushed the technology to create new levels of humor. When Kovacs died in 1962 at the young ago of 42, he had already made people rethink what could be done on broadcast TV. When the new medium arrived in the early ’50s, so much of the humor was adapted from radio and vaudeville. Television was something that captured performances to most of the talent that was hired in those early years. Ernie came up with ways to make the television technology part of the talent. The jokes could come from all over the screen. The best way to get a deep taste of this special blend is Ernie Kovacs: The Centinnial Edition. The boxset merges together both volumes of the previously released The Ernie Kovacs Collection. The first disc covers the early shows, but lacks anything from his first revolutionary show Three to Get Ready. During the early years of TV, stations didn’t turn on the power until later in the day. They didn’t think there was an audience. Ernie’s morning show quickly became popular to the point where NBC decided to create the Today Show. Why not videotape of this show? Basically they broadcast shows live at that time and didn’t have videotape for recording shows to rerun later. Ernie was shifted back to mid-morning which is where the boxset finds him on It’s Time for Ernie with two episodes from 1951. He’s having fun with the crew. He has a routine about how to adjust your TV to see him better. Ernie in Kovacsland was his network show that had him being the summer replacement for the Kukla, Fran and Ollie puppet show. This must have been a shock for a kid to tune in to see a strange man with a mustache and cigar strangling a hot dog vendor. Kovacs on the Corner is his version of a kid show that seems more like what the Addams Family would watch. There’s two episodes so you can to enjoy the weirdness from what we’d be told was a sane era of TV. Kovacs Unlimited gives him a longer show from New York with a studio audience. Imagine Saturday Night Live done every weekday afternoon. His mid-afternoon The Ernie Kovacs Show takes up disc two. He keeps up the weirdness. He gives us the strange bon vivant Percy Dovetonsils in a tiger striped jacket. If you wonder why Percy doesn’t blink, his eyes are glued on the other side of the Coke bottle glasses. Disc three contains his prime time version of The Ernie Kovacs Show. It was a summer replacement series, but Ernie seems right at home without a fear of sucking up to the audience. He has a great routine involving a sexually dressed weather girl who seduces with chatter about high pressure fronts. His “Whip the Wristwatch” gives us a game show that involves gunplay between the host and contestants. The fourth disc contains the special that made Ernie a genius in early television. Saturday Color Carnival: The Ernie Kovacs Show introduced America to Eugene. This was a dialogue free piece of weirdness where Kovacs used numerous gags to keep the audience glued. While it’s called “The Silent Show,” there’s music and sound effects. Kovacs on Music keeps up playing with sound and action. He gives us Swan Lake with gorillas in tutus. Take a Good Look appears to be just another guess what our guest does series with Ernie as the host and a trio of stars guessing the secret. Except there’s the angle of a surreal sketch that supposedly has clues. The episode here has Caesar Romero (Batman‘s The Joker) and Ernie’s wife Edie Adams. There should be more of these episodes since they go great with Match Game ‘75. The legendary ABC Kovacs Specials fill disc 5. While Ernie made eight specials, only the last five are here. This was Kovacs at his most refined. He brought back Eugene for a complete episode that was without words including the Dutch Masters cigar commercials. Ernie died before the eighth episode aired. The sixth discs includes isolated sketches from his NBC shows. Discs 7 through 9 focuses on Ernie’s time as the most demented morning show host and the perfect teasing game show host. The Ernie Kovacs Show aired on NBC from Dec. 12, 1955 to July 27, 1956 at 10:30 in the morning. Shortly after the Today Show ended, Ernie had his way with the housewives of America. The eight episodes featured here are a wonderful insanity as Ernie sits on what looks like the set of The Addams Family for a monologue about what’s in that morning’s paper. He’s like Regis without being Regis. The episodes aren’t complete since they had to slice out a few musical segments because of music rights. What a shame. Ernie creates a TV playground on the set. He has quite a few characters he shared with his audience including the poetry loving Percy Dovetonsil. He put on puppet shows and created crazy cab rides. If you ever want to draw a line between Ernie Kovacs and David Letterman, this show is it. Bill Wendell was the announcer for both men. Watching thes The big difference between the two is that Ernie didn’t have to book real interviews. He got to make fun of the phonies and fame lovers that clutter up the talkshow circuit. Plus Ernie could smoke his cigars on camera while Letterman hid them off camera. Both loved a certain level of mayhem on the screen. Ernie proved you could do weirdness at any hour of the clock and find an audience. Three episodes of Ernie’s Take A Good Look make a case that Ernie ought to be in the Gameshow Host Hall of Fame next to Gene Rayburn, Bob Barker and Groucho Marx. The show is like What’s My Line except the celebrities are supposed to get hints about the mystery guest through confusing video clues. The clues resemble Ernie’s blackout sketches from his ABC specials (featured on the first boxset). Ernie enjoys teasing his star pals Cesar Romero, Tony Randall, Ben Alexander and Hans Conreid almost as much as his wife Edie Adams. The mystery guests include Clarence Nash (voice of Donald Duck), Mack Sennett, Carl Reiner and Sen. Daniel Inoyue. This is a brilliant panel show that has its own dvd boxset if you’re interest. 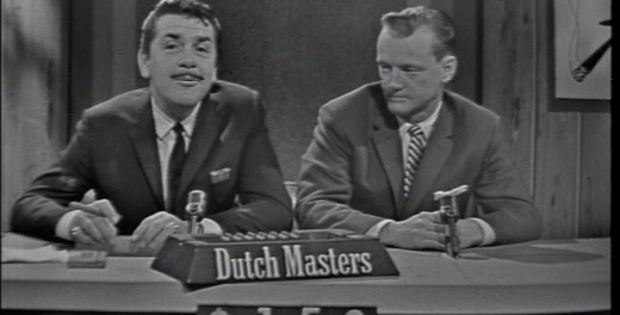 Ernie Kovacs: The Centennial Edition has so much of what made him such a genius of television. Half the time you are watching the show wondering how Ernie got away with it. Ernie remains revolutionary by even today’s standards. Even with all these cable channels and streaming shows, there’s very little that takes advantage of the trails that Ernie blazed. This boxset is the perfect gift for anyone you know who wants to make their comedy show for the web. Let them see the bar that Ernie set. The video is 1.33:1 full frame. The transfers vary in quality depending on their source. A lot of the shows are from kinescopes. This basically was done with a 16mm camera filming a TV monitor. There’s also some video. While there are rough moments, the genius shines through. The audio is mono. 1987 Academy of Television Arts & Sciences Hall Of Fame Induction (11:00) has Kovacs being honored 25 years after his death. Carl Reiner shares his tales of Ernie introducing Jack Lemmon to wasabi. Remembering Ernie (20:57) gives more details about the way he worked with memories of George Schlatter (Laugh-In) and Jolene Brand (performer –ABC Specials). Brand posed on the cover of Robert Mitchum’s calypso cover. Baseball Film (4:09) is Ernie playing every position on and off the field. His brawl with the umpire is arguing with himself. You can watch the film from when it ran on Ernie in Kovacsland in 1951 or The Ernie Kovacs Show in 1956. Making Of “Baseball Film (3:14) exposes color 8mm film of Ernie shooting the short. Ben Model narrates. The Mysterious Knockwurst (8:04) is a silent movie tribute to the silent movies including title cards. Performer Andy McKay’s 8mm Home Movies (6:50) gives us odd views of Kovacs making his show in Philly. Superclod Test (2:39) is the footage of Kovacs flying with green screen help. Take A Good Look Clues (4:12) are more of the surreal hints from the gameshow. I dare anyone to solve them. Take A Good Look Sales Film (3:36) lets Kovacs explain the show. He claims the original idea involved three sets of identical twin girls that the celebrities would have to match. He mentions the girls would be naked. Ernie was made for Showtime. Silents Please (8:34) are his host segments for a series featuring silent movies. Our Man In Havana Behind-The-Scenes Footage (3:20) was bought by the estate off eBay. Kovacs hangs out at the pool with a few starlets from the film. Dutch Masters Cigars commercials (11:54) makes you wish they still them sell cigars on TV. Such creativity and weirdness from a man who was passionate about his smokes. Kovacs was the original Mad Men. Ernie’s Trailer for Operation Mad Ball (4:27) is hosted by Kovacs. He wrecks the set. It Happened To Ernie (5:07) features Jack Lemmon and Kovacs for the film It Happened to Jane. Ernie gets a severe haircut for his role. Lemmon contributes to the scalp job. Muriel Cigars commercials featuring Edie Adams (7:06) has Kovacs’ wife sing about smokes. Both Muriel and Dutch Masters are from the same company so it wasn’t a house divided for the couple. Shout! Factory presents Ernie Kovacs: The Centennial Edition. Starring: Ernie Kovacs, Edie Adams, and Bill Wendell. Rated: Unrated. Boxset Contents: 9 DVDs. Released: November 13, 2018.